Jewelry Making Kits for Beginners - Class in a Box! 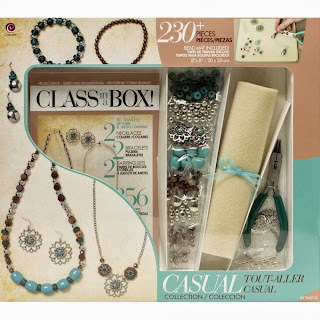 Just in time for holiday gift giving, you'll find a new selection of the popular Class in a Box! jewelry making kits in the store. These complete jewelry kits from Cousin are filled with everything a beginner needs to start making beautiful jewelry pieces at home. You'll find them in the Jewelry Making Kits section! The Class in a Box! 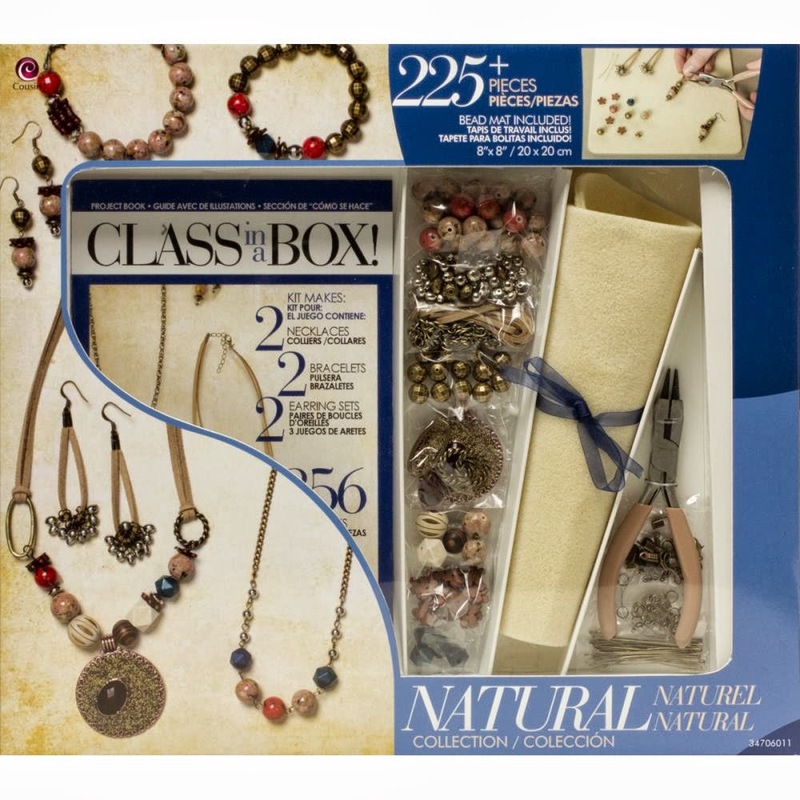 jewelry making kits include a full-color instruction book, bead mat, 3-in-1 jewelry tool, beads, and findings. Each kit contains enough jewelry making supplies to make 2 necklaces, 2 bracelets, and 2 earring sets. 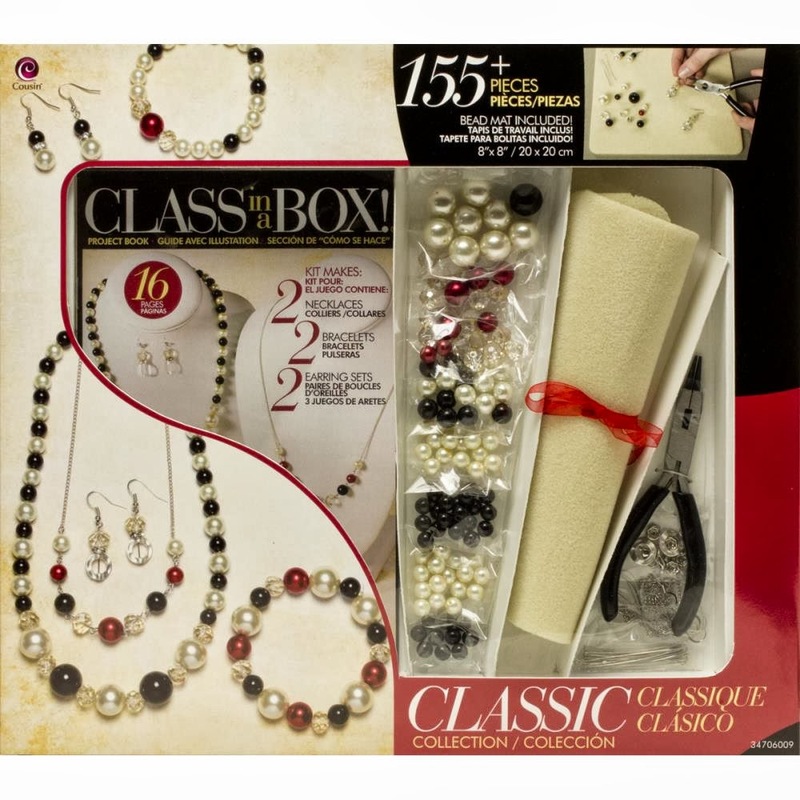 The completed jewelry pieces for each kit are pictured on the front of the box. Step-by-step instructions, including clear photos and diagrams, make it easy to learn each new jewelry making technique. Each kit features unique jewelry designs and coordinated color palette. The 3-in-1 jewelry tool combines 3 basic jewelry making tools into 1 set of easy-to-use pliers. This one tool serves as your round nose pliers, flat nose pliers, and wire cutter. The soft bead mat keeps beads from rolling off the table while laying out your jewelry pieces. The Class in a Box! kits are an ideal jewelry making kit for beginners. They're an excellent gift giving idea for older teens & adults wanting to learn basic jewelry making techniques. Visit the Jewelry Making Kits section for details on these kits and to see our complete section of beginner jewelry making kits, including a variety of jewelry styles from classic to modern. Weekend Kits offers a unique collection of Creative Art & Craft Kits for adults, teens, and kids. Our goal is to help making crafting convenient, easy, and fun for beginners & experienced crafters. Stop by today and be ready to make beautiful beaded jewelry on your next Weekend at Home. Thanks for visiting the Weekend Kits blog!